She’s back. 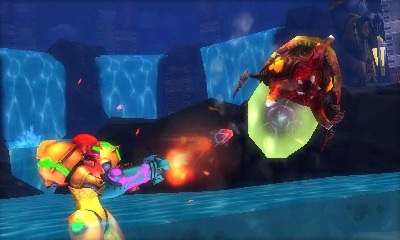 After appearing as a supporting character in Metroid Prime: Federation Force, the legendary bounty hunter Samus Aran once again makes landfall on SR388 to carry out a mission to exterminate the mysterious Metroid organisms. The Internet collectively swooned and combusted when Metroid: Samus Returns was revealed at E3 2017, developer MercurySteam “honoured” to have had the chance to work with Nintendo to break down 1991 Game Boy action-adventure Metroid II: Return of Samus, to rebuild it entirely from scratch for a new generation to experience on Nintendo 3DS. After misreading what the loyal fan base was longing for with Metroid: Other M and Metroid Prime: Federation Force, it wouldn’t be an overstatement to say that this reboot is wholly needed. Not only in heralding a return to the intense, side-scrolling gameplay that veteran players have missed for far too long, but in lending a clearer reason as to why newcomers should start to become invested in the bounty hunter’s escapades as Metroid Prime 4 on Nintendo Switch draws ever closer. Those that have already tackled the particularly punishing Metroid II: Return of Samus will know that the game’s story presents a critical moment in Samus Aran’s tale that leads straight into the events that unfold in Super Metroid. That chance to revisit and retouch such a pivotal point was, therefore, understandably irresistible, but MercurySteam has been given enough leeway to modernise the somewhat aged 26-year old foundation. I was lucky enough to spend just over another hour with the Nintendo 3DS exclusive, exploring Area 1, as I was told is how Samus uncreatively labels it, that lies immediately after the tutorial section shown at E3 2017. This area hides four Metroids, and our challenge was to hunt them out and defeat them in the time given. Choosing to play in stereoscopic 3D on a New Nintendo 3DS, what readily impresses is the concerted effort to nail the visual style. There will be some that will miss the classic 8-bit pixels, but Samus stands defiantly in intricately layered and interwoven environments that breathe far more life into the Metroid home planet. That won’t come as a surprise to anyone that wandered the gothic world that MercurySteam created for Castlevania: Lords of Shadow – Mirror of Fate, and it’s clear that lessons and visual trickery learned with the hardware then have been put into practice once more. It results in a far more immersive experience, made all the more engaging by the freedom that you are given to explore your surroundings. Whether wall jumping, morphing into a ball to roll around a restrictive tunnel or grabbing on to ledges as you clamber around, there is a tremendous fluidity to your exploration. 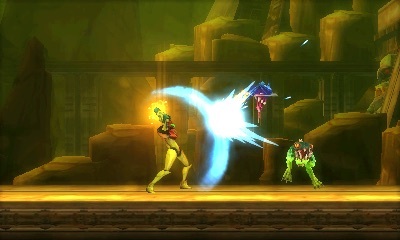 And surprises, too, that make SR388 feel all the more hostile, and Samus an unwelcome guest. The best example of that was when I ran into a room filled with molten lava, dashed out when I noticed that it was sapping my energy, and continued to explore the labyrinthine corridors, only to end up entering the same room from the other side. I laughed that off, but there is a helpful mapping system on the touchscreen that will plot out all the rooms you have been to as you explore, as well as letting you mark anything that you have spotted. Aeion abilities, powered by a mysterious new resource called, well, Aeion, will also help you on your mission, although at such an early point in the game I only had access to Scan Pulse. It briefly reveals any breakable objects in your immediate vicinity, and what lies in the rooms around you on the map – an optional hint system that will help to point you in the right direction when needed. The planet feels all the more inhospitable thanks to the alien creatures that call it home. They’re everywhere. The new 360-degree aiming makes taking them down all the more gratifying, Samus planting her feet firmly on the ground as the player targets their enemy. If you get too close, enemies will readily lunge at you, but, there is a new melee counterattack move that can see you knock them back to then unload your plasma cannon into them – if your timing’s good enough. Weapon and suit upgrades, as always, will let you explore more freely, with Area 1 hiding the Bombs for the Morph Ball, the Ice Beam, and the Spider Ball. Everyone that was in the same session as me all discovered these in a different order, so, that should give you some idea as to how loose the structure is in each area. There are still rooms that will require certain upgrades to access – whether that be using the Ice Beam to freeze enemies in place as makeshift ledges – but you’re largely left to your own curiosity. There are more menacing enemies that likely lie deeper below SR388’s surface, but, in Area 1, the toughest enemies were the Alpha Metroid. These enemies flat around above you dropping bombs of electricity, and, after slamming them with a melee counterattack when they eventually lunge at you, defeating them only requires a missile barrage to their squidgy bellies. I’m far more excited to see what tougher bosses MercurySteam will throw at us, though. Metroid: Samus Returns, so far, promises to be everything that you could ever want from a Metroid game: hauntingly atmospheric, brutally action-packed, riddled with secrets, and unpredictable, even. 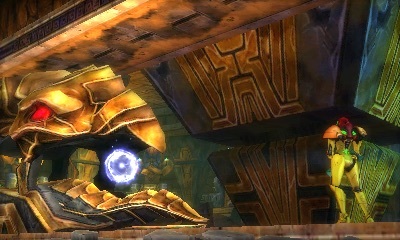 With the four Alpha Metroid eradicated to activate the second Chozo Seal, I can’t wait to discover what comes next. Metroid: Samus Returns will release exclusively for Nintendo 3DS worldwide on September 15th.